I wandered downtown late one afternoon a few weeks ago feeling frustrated by the limitations of my own work and in search of distraction. On the way to the National Gallery – a reliable antidote to melancholy - I passed the forecourt of the Royal Academy, and I never made it further. 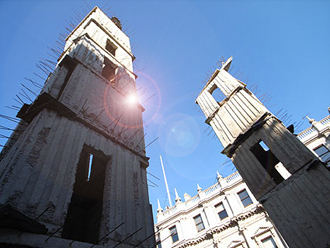 Two tall, archaic looking, vertiginous, and oddly fragile towers stood under the gaze of Sir Joshua Reynolds. The installation looked as if it had been tele-transported from Rajasthan, Samarra or from inside Dante’s brain. Peering at a small sign, I saw the two towers were called Jericho which confirmed this heterodox rag-bag of associations, and thoughts of battles, crumbling twin towers and crumbling civilisations washed around in my head. It was very portentous, very powerful, and very Anselm Kiefer. I highly recommend it. Hearing the artist vigorously (disingenuously?) disavow any resonance about September 11th a few nights later on the radio – in what seemed to me a deeply shocking diminishment of the significance of that day – I went to White Cube to see the new “wall works” with mixed feelings. 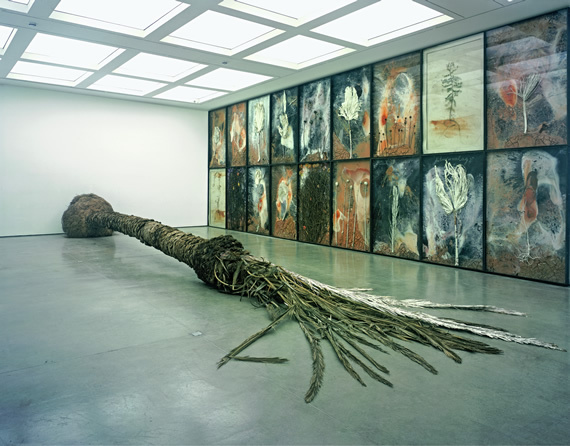 With Simon Schama’s recent eulogy in The Guardian in mind – an anointment of Kiefer that must have embarrassed the artist in its fulsomeness – I went to White Cube prepared to be transported by greatness, or conversely disappointed. In the event, I was neither. I am well aware of Kiefer’s reluctance to be “understood” and his dislike of interpretation. I enjoy the deliberate opacity and complexity of his iconography, and appreciate his desire for the viewer to use his or her own stores of cultural memory. The didacticism of so much recent art shown in this gallery is tedious, so this show, Aperiatur terra (et germinet salvatorem et iustitia oriatur simul (Let the earth be opened and bud forth a saviour and let justice spring up at the same time) is very liberating and resistant to pat interpretation. On the ground floor of this exquisite space there is Palmsonntag. Museum vitrines of plaster “embalmed” palm fronds stand sentinel over a palm tree – magnificent in its death upon the pristine gallery floor. This work is heavy with reverence and ideas of renewal. The tree is an emblem of nature in all its magnificence and Kiefer is giving its growth a form of eternity in the glass cases. The archivist in him is very present; the taxonomist too. But there is mortality and the fragility of nature in this room. Of course there is also a more human, if numinous reckoning too. We are well aware of the poignant story of Christ’s joyous arrival in Jerusalem, before the agony on Golgotha. This is Kiefer after all. Downstairs, there are three large paintings, Aperiat Terra et Germinet Salvatorem, Olympe – für Victor Hugo and Rorate caeli et nubes pluant iustum. Though I feel Kiefer would not have it so, these are noble failures. They are almost conventional landscapes with evident vanishing points upon the horizon. Kiefer negates the eye’s natural travel into the paintings with smeared, kitsch images of poppies, with all their tragic associations, upon the paintings’ surfaces of baked earth, paint and shellac, and the result is awkward. I suspect the garishness is entirely desired, but the result is curiously antipathetic towards looking, and surely this is what he wants us to do? Kiefer’s flaws as an artist are courageous and interesting – if disturbing. In his own words the gallery holds work that takes us to “that place where we can find the goal which we can never find on purpose” but it is worth the detour to find that place in central London.